Thermal Protective Clothing for Firefighters explores the materials, design, and usage of thermal protective clothing. The characteristics of fire hazards are discussed in detail, and the thermal environments faced by firefighters in these fire hazards are also examined. The different types of potential burn injuries and the heat stress that occurs to firefighters’ bodies when exposed to such thermal environments are analyzed. Furthermore, the development of various high performance fibers and fabrics for thermal protective clothing is discussed. The test methods and existing standards to evaluate the thermal protective and physiological comfort performances of the fabrics and clothing are critically reviewed. Recent developments in the field of fire- and heat-resistant materials have led to significant improvements in thermal protective clothing. In parallel with this, the complexity and risk levels of fires, especially in industrial-storage facilities, and developments in health and safety cultures have increased the demand for high-performance heat- and flame-resistant clothing and equipment, designed to mitigate skin burn injuries and reduce risk of death from fire hazards. Throughout the work, the gaps and limitations in existing test methods and standards are identified, and approaches are recommended for the development of enhanced test methods. Scenario modeling and its implications for firefighters’ protective clothing is discussed, and various factors affecting performance are established. Finally, various key issues related to thermal protective clothing are addressed to guide the future research in the field of thermal protective clothing for firefighters. 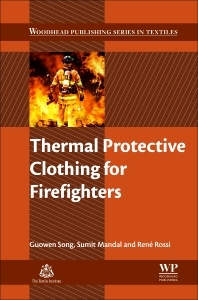 This book will help materials-textile engineers to develop high performance thermal protective clothing that can enhance the protection, safety, and comfort of firefighters. Dr Guowen Song lectures in human ecology at the University of Alberta, Canada. His research concentrates on the protection and comfort of textile materials and garments with particular emphasis on the understanding and modelling of heat and moisture transfer in clothing. Sumit Mandal is a Postdoctoral Scientist in the Laboratory for Protection and Physiology at Empa- Swiss Federal Laboratories for Materials Science and Technology, Switzerland. He did his PhD in Textile and Apparel Science from the Department of Human Ecology, University of Alberta, Canada. He received his Bachelor and Master Degrees in Textile Technology from Calcutta University, India and The Hong Kong Polytechnic University, Hong Kong. He also received a Post Graduate Certificate in Higher Education from Nottingham Trent University, United Kingdom. His current research focuses on protection and comfort of textiles. He has published numerous research papers and book chapters related to textiles and clothing. Before his PhD, he served as an Assistant Professor (Textile and Apparel Technology) in India. In his academic career, he has received prestigious scholarships and awards including the FS Chia Doctoral Scholarship, Alberta Innovates Graduate Scholarship, Izaak Walton Killam Memorial Scholarship, and Betty Crown Graduate Scholarship in Textile and Apparel Science. Dr. René Rossi is Head of the Laboratory for Protection and Physiology at EMPA in Switzerland which focusses on interactions between materials and human skin, as well as to optimize the protection and ergonomics of systems. The products developed in collaboration with industry are used in the fields of occupational safety (accident prevention), sport and medical applications.